Salvia Kisses and Wishes is the fourth colour in the Wish series of Salvia – an exciting new bright pink. Developed by Sussex-based nurserywoman Sarah Knott, it is being launched at the Royal Horticultural Society’s Chelsea Flower Show 2018. Salvia Kisses and Wishes was discovered as a mutation in a batch of Salvia Wendy’s Wish by Sarah Knott of Southwater, West Sussex, in 2015. She worked to ensure that the plant was stable and then, together with her agent Plants For Europe Limited, established the plant in trials and production with Salvia expert William Dyson of Dyson’s Nurseries and with wholesale growers in the Netherlands and Israel. Kisses and Wishes is being launched at the Royal Horticultural Society’s Chelsea Flower Show 2018 by Hardy’s Cottage Garden Plants who have a double celebration this year – their 30th year of trading and the 30th wedding anniversary of nursery owners Rob and Rosy Hardy. So Salvia Kisses and Wishes seems a very appropriate plant to be launching! Kisses and Wishes is the fourth colour in the Wish series of Salvias and joins Wendy’s Wish (purple pink), Embers Wish (bright red) and Love and Wishes (dark purple red). Fun fact: each of the Wish Salvia varieties has been bred and developed by a different breeder and Kisses and Wishes is the first to be developed outside of Australia! Salvia Kisses and Wishes is a perennial plant for a sunny position. It grows well in a border or can be grown in a container either on its own or in combination with other plants – perfect for the patio. It has branching, upright growth and produces a never-ending display of bright pink flowers from May until frost – literally months of colour. It will grow to around 75cm high by 45cm wide when mature. It needs no dead-heading – the old flowers simply fall off when they are finished. It needs a fertile soil that does not become waterlogged. It is not winter hardy, so you will need to protect it from frost if you want to keep it for next year. alternatively, just grow it as a summer plant and plant a new one each spring. Bees love Salvias and Kisses and Wishes is no exception. Help our pollinator friends by planting one in your garden! Launch at the Chelsea Flower Show! 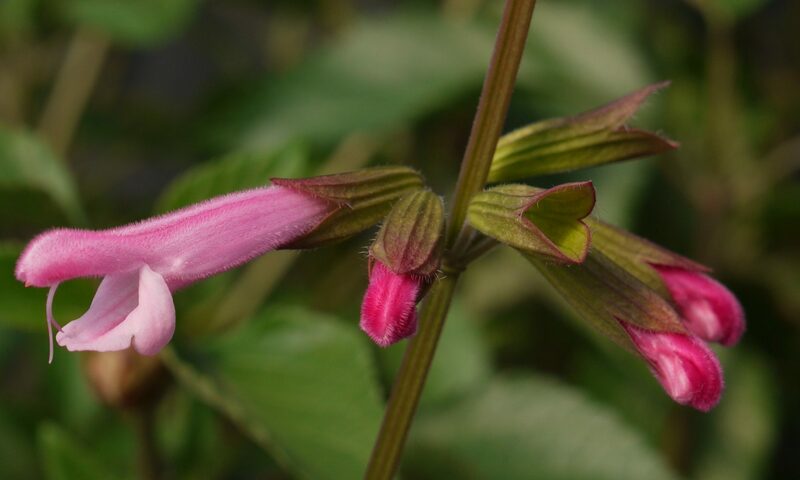 Salvia Kisses and Wishes will be launched at the Royal Horticultural Society’s Chelsea Flower Show 2018 by Hardy’s Cottage Garden Plants. Look out for kisses and Wishes on TV, in newspapers and magazines – it’s sure to create a stir!